Sale Price $ 279.95 18" blades The Husqvarna 122HD45 hedge trimmer is a "light weight easy to start" that has been officially recommended and tested by the National Home Gardening Club with an oustanding 100% approval rating! 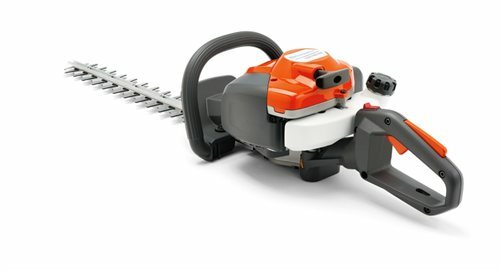 Users noted how this "well balanced and low vibration" hedge trimmer was more than impressive one user says "that's a nice cutter". Here at Athens Lawn & Garden LLC we sell only the best equipment like the Husqvarna power equipment line. We take pride in our mechanics ability to deliver the best service, or sales staff to be the most helpful, and making the experience one of the best you've had. Athens Lawn & Garden has been a leader in sales and service of Husqvarna equipment for over 32 years. Call or come by today and let us help you pick out the right piece of equipment for your lawn care needs. The 122HD45 has officially been tested and recommended by the National Home Gardening Club with an 100% approval rating! Criteria for testing included ease of use, quality, design and performance (just to name a few). Users noted that the 122HD45 was "light weight and easy to start" and an "excellent cutter".